I think my friends and family would let out a giant gasp if I didn’t acknowledge Cinco de Mayo in this blog. No, not because it’s a holiday that we all celebrate with great fervor (although in the US it is giving St. Patrick’s Day a run for its pot of gold). But because of the fine spirit associated with it – tequila! Yes, it’s true, Mexicans love tequila. But so does everyone else. And while you certainly don’t need Cinco de Mayo as a reason to drink the good stuff, it’s still a good excuse. By the way, Cinco de Mayo is not Mexican Independence Day – had to throw that in there. My guess is that your first experience with tequila involved some raucous college party or a sin-filled spring break where someone acquainted you with none other than Jose Cuervo. Hey, I did it too and those were good memories, but I hope as we’ve all grown up, we have learned that tequila is not a drink to pound. Like our good buddy whiskey, tequila should be slowly sipped and enjoyed to appreciate the deep flavors that will translate into a party in your mouth. So on your next excursion to your local cantina, do me a favor and ask them to recommend a good blanco, añejo, or reposado. You won’t be sorry. Speaking of cantinas, let’s talk about one of the best tequila bars in Chicago. 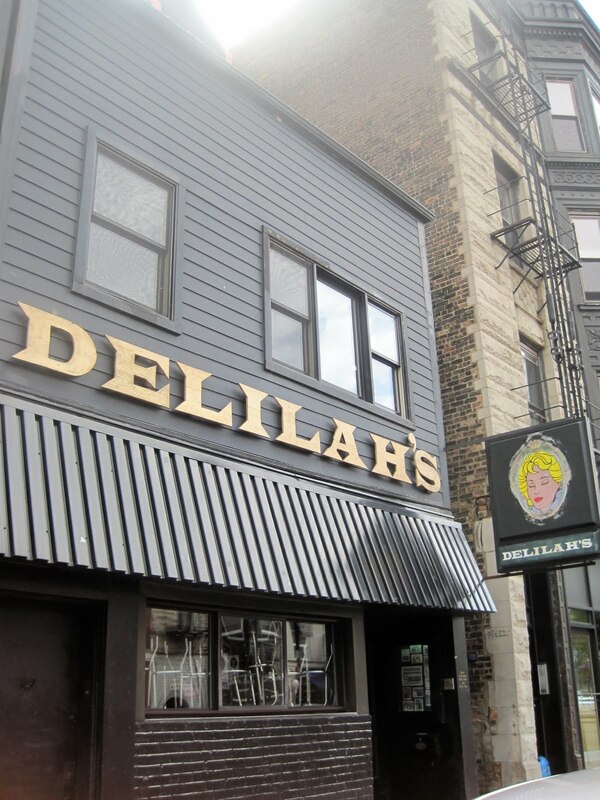 Standing short, yet proud in an early 1900s two-story building, Delilah’s is located at 2771 N. Lincoln Ave. And, yes, it’s the same Delilah’s that is internationally recognized as the best whiskey bar in the world. Yup, THE WORLD! And rightfully so. Delilah’s is an absolutely amazing whiskey bar with over 400 options. But guess what, tequila is up there too! In 1917, a man named Frank J. Ruh owned the building. His family lived on the second floor and his plumbing business, Frank J. Ruh and Sons, was located on the first floor. Interestingly, in the years that followed, records show that it became a water heater store – maybe Frank realized he was better at sales than plumbing? Like many other Chicago establishments, this location was a speakeasy or a key club during Prohibition. A key club was the type of place that you paid a monthly/annual fee, got a key, let yourself in and helped yourself to drinks. No bartender, no waitresses – a simple place where you could just get some booze. Today, you can still see the key slot in the front door. Shortly after 1933, it became a tavern called The Lincoln Inn, but to regulars, it was known as Vink’s after the joint’s “operator”. That place lasted for quite some time and in 1980 it changed hands and became Clark’s. Clark’s was owned by a gentleman named Vince Clark, no not of Depeche Mode/Erasure fame, but of regular Joe kind of fame. Actually, Vince is still around and works at the Green Mill in Uptown. In 1990 it became a rough and tough punk bar called Crash Palace. Rumor has it that it was at the Crash Palace that Courtney Love picked up Kurt Cobain – I wonder if this meeting was his inspiration for “Drain You”. A young man from Buffalo, NY named Mike Miller stumbled upon Chicago in the late 1980s. Bartending at various establishments, he hated the bar scene, but loved the bar biz. After saving some dough, Mike purchased the bar and transformed it into Delilah’s. His goal with Delilah’s was to create a place that reminded him of the bars he would frequent in his native Buffalo. Mike was/is a beer geek who was really into home brewing – he and his pals would go to neighborhood pubs, drink good beer, and listen to live music or just sit around and listen to LPs. Today, it’s just that – a dark place that has been deemed a great rock bar, punk bar, and neighborhood bar all rolled up in one. The music variety is almost as good as the booze options. Here you have one of the best jukeboxes in the city, maybe even the best. Then throw in local DJs spinning anything and everything from their personal collections and random appearances from Indie label record companies. Ladies and gents, we have a winner. With eclectic paraphernalia on the wall and a cozy couch in the corner, the ambiance adds another layer of quirkiness, uniqueness, and interestingly, comfort. As Mike’s palate evolved, so did his bar – his love for good beer quickly led to Delilah’s becoming a pioneer of craft beer in Chicago. And that’s just one of the reasons I love Delilah’s. They have over 300 beers available and every year they host the vintage strong beer festival. Once Mike conquered beer, he moved on to whiskey. Like his love for craft beer, his passion for whiskey grew and grew. Today he carries over 400 whiskeys and has been nominated and awarded best whiskey bar in the world. In fact, Mike now makes and bottles his own and has also received kudos from the whiskey world for that. In the midst of his whiskey journey, Mike decided he wanted even more. A natural progression from whiskey, Mr. Miller moved on to tequila. When Delilah’s opened in 1993, the bar carried 10 types of tequila. If you recall, most bars at this time probably carried only one – the aforementioned JC. And of those ten you had probably only heard of maybe one. In 1993, Delilah’s was a pioneer in the unique spirits scene and that is just one of the reasons it’s a great tequila bar. But there’s more. Mike looks at whiskey, tequila, and vodka through the same lens that he does the craft beer industry. It’s important to support small businesses that are creating good products because it’s all about helping the good guys, and doing that guarantees that you get the best of the best. And Mike goes to great lengths to make sure his tequilas truly come from boutique distilleries. He explained that, for various reasons, it’s truly difficult to know who’s producing and controlling the types of tequila found in the field. With visits to Mexico and constantly communicating with aficionados of the industry, Mike makes sure the stuff in his bar is the real deal. Oh, and it doesn’t hurt that he’s been a judge at the World Tequila Championships for the past ten years. Tequila is a spirit that comes from the agave plant – a unique organic product that is always changing. For this reason, it possesses quirky characteristics that always keep you guessing. It certainly keeps Mike on his toes, and that’s a good thing. It’s because of this that you can pretty much guarantee that Delilah’s will always have something new for you to try. Give the Tobala a whirl – it’s actually a mezcal that is made form a wild agave that only grows bi-annually. Or the Pechuga, a tequila that brings two towns together for a tequila-making party for one day in December. The stuff that goes into it is as unique as the story behind it. As a judge for various competitions, Mike prides himself on the fact that he has tried over 10,000 kinds of spirits. Everything you can imagine. 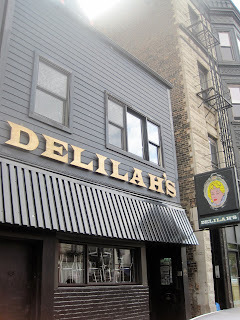 Support of small farmers and boutique distilleries coupled with a great variety of options to try – that’s why Delilah’s is probably the best tequila bar in Chicago and that’s why I like it. And the fact that Mike only carries the ones he likes, that’s why I like him. Another reason to like Mike – for the month of May, head to Delilah’s and mention Tales, Taverns, and Towns. When you do, Señor Miller and company will provide you with an exceptional tequila flight for you to purchase and taste. It’s a rare opportunity and one that yours truly will be taking advantage of early and often. So why Delilah’s? Delilah was the first femme fatale in Western Literature and if you know her story and apply it to the tavern’s environment, you will find some interesting similarities. Plus it’s a great Tom Jones song. No wonder sometimes I leave that place singing, “forgive me Delilah, I just couldn’t take any more”.